In the intense footage, Bieber can be seen sitting in the backseat of a moving car when a fan runs up and touches his chest through the open window. The man then continues to run alongside the vehicle with his hand inside, before Bieber socks him once in the mouth. Shocked onlookers immediately gather around the man, who was left with a bloody lip. Although it can’t be seen clearly in the video, a source close to Bieber tells Gossip Cop the man grabbed the singer by the face. Bieber’s personal space has become a particular issue over the past few days. Late last week, while the singer was in Prague, a fan grabbed Bieber’s pants and pulled them down, exposing his rear-end. A bodyguard for the singer, pulled his pants back up and rushed him into a car for safety. 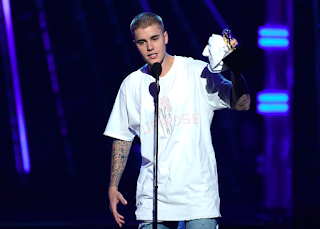 Bieber also got into a slugfest in Cleveland in June when he was in Ohio for the NBA Finals. A man took a swing at Bieber’s head inside a hotel, leading the singer to throw a counterpunch. Bieber and the man then wrestled on the ground, and were pulled apart. Interestingly enough, this isn’t the first scuffle the singer has gotten into in Spain. In 2014, he got into a shoving match with Orlando Bloom outside of a restaurant in Ibiza.